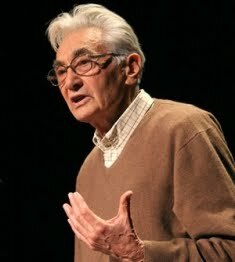 Howard Zinn was teaching a class, but he wasn’t yet a professor and his classroom wasn’t at a university. It was late 1951, and the students who gathered for Zinn’s lessons in Brooklyn were his fellow members of the Communist Party USA. That description, furnished to the Federal Bureau of Investigation by a former Communist in 1957, is included in more than 400 pages of Zinn’s FBI file made public last week. The FBI files demonstrate beyond reasonable doubt that Zinn — author of A People’s History of the United States, widely used as a textbook or supplement in many of our nation’s high schools and universities — was a card-carrying Communist at a time when the Soviet Union was America’s most dreaded enemy. . . .
Read the whole thing. It’s two pages, so it might help to click the print-friendly version — which is also convenient for sharing with your local board of education, high-school principals, college professors, etc. If you read Zinn’s book, all doubt of his sympathies would be removed. Yeah, he was an enemy of the United States and thought the Soviet Union was the proper model to follow. Um… Never been a fan of Zin, myself. Heh. Cleon Skousen could of told you that Howard Zinn was a Naked Communist.